What comes after brands? Lovemarks do. So says Kevin Roberts, CEO of Saatchi Saatchi Worldwide and author of the recently published book, Lovemarks: The Future Beyond Brands. According to Roberts, Lovemarks are brands that have evolved from simply being bigger, brighter, stronger, and cheaper to being a brand that uses mystery, sensuality, and intimacy to emotionally connect with consumers. Apple is a Lovemark while Gateway is a brand. Lexus is a Lovemark but Pontiac is a brand. Container Store? A Lovemark. Storables? A brand. In other words, brands merely fulfill needs while Lovemarks fulfill needs and desires. So why does it take over two-hundred overly-designed, high-gloss pages to tell this story? Lovemarks reads like an advertising agency capabilities PowerPoint pitch deck on steroids. 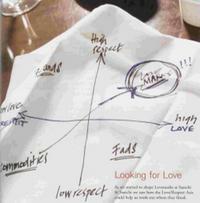 Many of the case study brands mentioned as lighthouse Lovemarks come from the Saatchi & Saatchi client roster. This Lovemark approach to building brands plays like Saatchi & Saatchis pseudo-proprietary system for extracting and articulating the essence of a brands DNA. But wait if you strip away the thick advertising agency varnish, you uncover a killer branding concept: Brands that connect emotionally with customers and forge loyalty beyond reason transcend from being just a brand. Do these brands become Lovemarks as Roberts contends? Thats up for debate. What is not up for debate is that there is a place where few brands earn the right to evolve to. This is a revered place where love trumps respect in terms of how a consumer relates to a brand and a brand relates to a consumer. Roberts expertly articulates this sweet spot through his simplistically brilliant Love/Respect two-by-two axis. Unfortunately, Lovemarks is more a what and why book and less a how-to book. Roberts eloquently explains what the Lovemarks concept is and why it is important. But he neglects telling how-to create a Lovemark. The only guidance Roberts offers companies on how to transform their brand into a Lovemark is to get closer to their evangelical customers. Because of this, Lovemarks is a book marketers will fall in like with, but not in love with. reviewer quick bio: johnmoore has made his mark in the marketing world at Starbucks Coffee and Whole Foods Market by using creativity, big picture thinking and liberal doses of levity to solve marketing problems. What a tremendous reversal of fortune for this once destructive problem-child turned constructive problem-solver. Dave Lakhani at Bold Approach recommends reading materials for an effective marketer/marketing program: Click over to check out his takes on the following books: The Power of Impossible Thinking by Yoram Wind and Colin Crook with Robet Gunther The Fortune At The Bottom of the Pyramid by C. K.